- COMING FROM NORTH Motorway A14 Bologna/Ancona, exit Cesena Nord. Highway E45 direction Ravenna, exit Mirabilandia. - COMING FROM CENTRALK ITALY Motorway A1 until Orte. Highway E45 direction Ravenna, exit Mirabilandia. - COMING FROM SOUTH Motorway A14 Bologna/Ancona, exit Cesena Nord. Highway E45 direction Ravenna, exit Mirabilandia. - COMING FROM THE SEASIDE RESORTS OF RIMINI AREA Strada Statale SS 16 "Adriatica", direction Ravenna, otherwise Motorway A14 direction Bologna, exit Cesena Nord. Highway E45 direction Ravenna, exit Mirabilandia. At the Park by bus: only at €6! In collaboration with Bonelli Bus you can reach the Park, from the major touristic cities of the seaside, at only €6 per person! The nearest main railway stations are Ravenna, Rimini and Cesena; the nearest station to Mirabilandia is Lido di Savio/Lido di Classe. 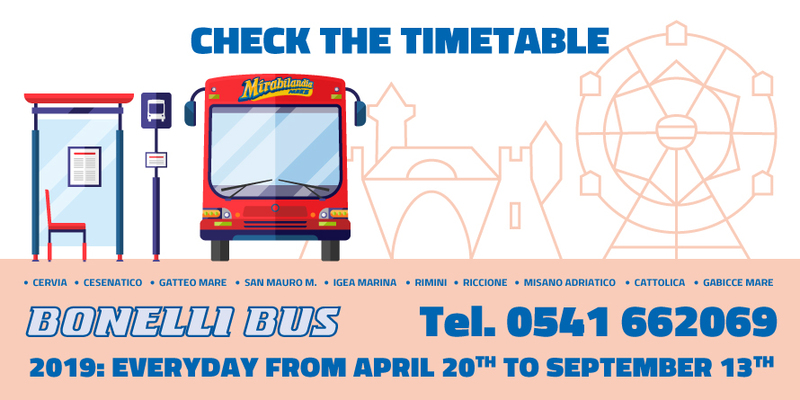 A shuttle bus takes visitors from the railway station of Lido di Classe/Lido di Savio to the park (please check here the timetable), in connection with main trains arriving and leaving at/from the station (Ravenna/Rimini line).